Take exit #244 (Camp Roberts) off US-101, to main gate. After entering gate, stay to the left at the Y onto California Blvd. Go about .4 miles to the first stop sign and turn right onto Arizona Blvd. At the next stop sign, Billeting is on the left at the intersection of Arizona Blvd. and New Mexico Ave. Check in here. -- When a site has been assigned, go back the way you came (Southeast) on Arizona Blvd. At the first stop sign, turn right back onto California Blvd. At the end of this block, turn left at the Y and go Southeast on Washington Blvd (one-way road) for .9 miles. Again, stay left at a Y in the road, turning onto Michigan. Go .3 miles to the first street on the right. There is a small white sign pointing to the RV Park. Turn right onto Kansas and go .8 miles to the campground on your right. 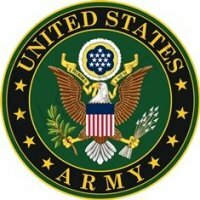 Active, National Guard, Reservists, Retired, 100% DAV, DoD/Non-Appropriated Fund civilians active and retired, Federal Employees, sponsored civilians (Guests). At Garrison Commander’s discretion: general public at MWR events and Non-DoD Federal employees working on installation. Tent camping not allowed. Some sites don't have water - you need to use your neighbors spigot. Initial stays are up to 90 days with two additional 60 day stays with waivers dependent on vacancy. If approved up to the 210 day maximum, guests must move out for 7 nights minimum before a new reservation can be made. Lower rates for military - higher rates for civilians. Golden Age/Access and America the Beatiful cards are at the lower rate. All other shopping is 15 miles away. Barren is the best word to describe this Park. Bringing in an Engineer Unit for their Annual Training to fix this Park up would be a good move. The distance from the front gate is long and the route is not well marked. The sites are not well marked either and in dire need of upgrading. The price is right considering the overall condition, but improvements could allow for an increase in rates. I had no problem figuring out how to place my trailer, but with the barren state of the area, (no trees or growth of any kind, the winds made things even worse. A quick layover between stops is almost not worth the effort. Proximity to Paso Robles is not that great, and given the proximity to the Main Gate, plan for a day trip if you're staying for more than a night. I stayed for 4 after cutting my stay short. There is an exchange on Post, but not much else and Wifi is non-existent unless you are on active duty. Overall this could be a great stop, but it needs work. Hope this helps, safe travels. Pretty isolated, large sites, no tables, no WiFi, reasonable fees at $15 @ night. I agree that there were a lot of homesteaders. However, there are sites set aside for short-term visitors. The internet café only has wifi if you are active duty or National Guard or Reserve. I had full hookups with my own electric, water, and sewer. I did see the poor amenities for the back-in sites. The gravel was loose on some sites to a point of not recommending a motorhome or larger 5th wheel on it. Most of the long term (homesteaders) do not maintain their sites. The sites are cluttered with furniture, wall lockers, broken down vehicles, and high weeds. There was a popup camper with a shredded blue tarp attempting to cover it and the weather had blown pieces of it on the ground for several sites. The landscaping crew came and weed eated the area, but left high grass/weeds everywhere. I don't mind being away from the shopping, just plan accordingly. This is a good stop over site, but if I were staying for and extended time, I would have to bring the Chain of Command's attention to the FamCamp, because I can't believe they would ignor what they are aware of. But you pay for what you get for $10. Overall this is a good spot for a one-nighter if you are traveling on hwy 101. I do have to say though that there are two errors in the directions written under "Featured Facilities" back in 2007. 1) After leaving the main gate and bearing left onto California, go to the second (2nd) stop sign, which is Arizona. The first one is Montana. 2) After leaving the Billeting Office, you will want to go southeast on Washington which is actually a two-way road, not one-way). It was a good thing we had the directions from this website because the lady in the office gave us a map and sent us southeast on California, which is back near the gate. This road ends in a dead end! The other criticism I have is that when we pulled up to the main gate, the guard was chatting with his buddy who was in a police car. Not only did he ignore us, he made us wait almost 5 minutes!! I will say that the site we had (2) was very good with full hookups including 50 amp which we needed for A/C (91 deg!). My impression of this place is pretty much the same as the November 2013 review by Don Geidel. This base saw its heyday during WW II and it’s been going downhill since then. In April 1971, the California Army National Guard took over. This is got to be the worst looking base I have seen and the campground isn’t much better. We were traveling between Los Angeles and Monterey and this was a convenient place to stop for one night. The only positive thing I can mention is the $10 for a full-hookup site. The ironic thing is that the campground is full – I got the last available site. But the reason for that is the homesteaders. They have pretty much taken over and I understand that there is a waiting list. First off, I should say for $10 a night for full hook ups I guess you can't go wrong. Having said that, we would not stay here again. We came in on a weekend, so no help from the RV park manager, who doesn't work weekends. The signage for the RV park was terrible and after taking a long, fruitless tour of the base we ended up back at the main gate somehow and asked the soldier there for directions. Even with directions it was difficult to find the park due to construction detours. Calling this an RV "park" is generous. It is a dump. The whole base is, sadly, a dump. What an insult to our fine National Guardsmen that they are forced to train and work on this shameful base. 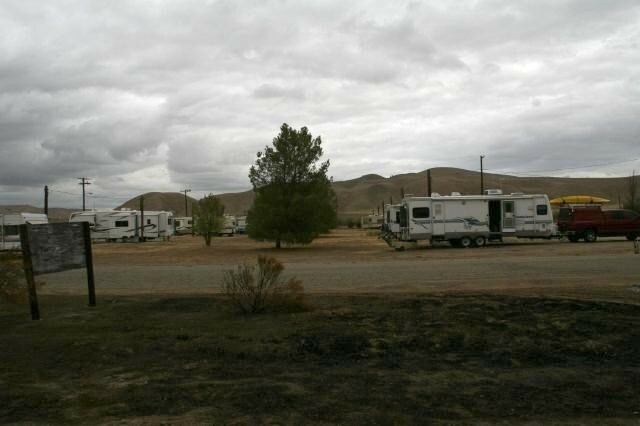 The base itself is ten miles or so from the nearest town, and the RV area is another four miles or so inside the base. This is certainly not a place to spend a week. If you are passing through this area then perhaps a stop would be okay for one night. Using this place to sightsee from would be a mistake. We had planned to stay four nights but left after one. Of the dozens of famcamps we have stayed at over the past few years this is by far the shabbiest. Wow!!! Has this place changed. At least 90% of the old WW II buildings have been destroyed. There are newly paved roadways through the most active part of the camp, and the staff is just as friendly and helpful as before. The old mobile home park has been leveled. The 10 new (since 2010) pull-thru sites have 20/30/50/W/S. Most of the older sites appear to be occupied by active duty personnel. In Sept, the scenery is somewhat stark. The surrounding hills are brown from lack of rain and the heat of the summer. However, we've been here in the spring, and those same hills are a beautiful shade of green. This place is the best value if you are visiting the area. The area includes Paso Robles, it's shops and wineries, San Simeon (Hearst Castle), Parkfield, or if you are interested in wildlife, explore the camp along the perimeter road. We've seen deer, fox, coyote, and turkeys. This is a favorite stop for us every time we travel between northern and southern CA. T.P. left this review using the Directory software: - While the office personnel were very nice and helpful that was about the only good thing about our visit to this camp. We made reservations for two (2) days in a pull thru site well in advance and were assigned a site number. Two days prior to our arrival we were contacted and told our site number had changed. When we arrived the nice lady at the desk informed us that the people in the site that we were assigned to had failed to vacate the site so we would be put into a back in site. No big deal as I had intended to drop the Toad anyway. When we got to the site there was no pad gravel or otherwise heck there wasn’t even a path just a pole with a number on it. After leveling up a process which required some moving around to find a spot level enough to be able to level the coach, I went out to hook up. Had electrical and Sewer but no water there wasn’t even a pipe much less a faucet. Ended up moving to the other open site putting my rig between two sites because it didn’t have water ether and running my sewer hoses to one site and sharing the water with the occupied adjacent site after I repaired the leaking faucet. We cut out planned visit short and left the next day never to return. Truly a No Frills place. We stopped here so we could visit the Hearst Mansion and check out some wineries (the wineries are abundant). The RV park is a it of a distance from the gate, really away from everything. Close to the highway, you get a hint of noise, but no quick access. It is obvious that they are working on making this Famcamp a nice stop. There are new sites with great utility islands. Currently a lot of dirt in the "yard space" but it has been plowed and leveled like they plan to see or put in more sites. There is plenty of gravel in the new sites but the low spots in the roads were evident when it rained. We were certainly at Camp Roberts during a slow time for the camp so I can honestly say it was quiet and uncongested; just the opposite of what it is probably like in the summer during training sessions. 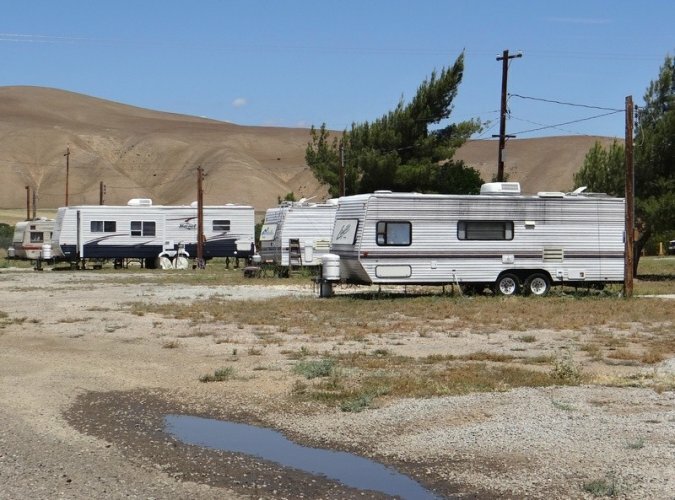 I shared all this so you understand the starkness of the park, but to be sure, this is a great value if all you want is a safe place to park your RV while in the Paso Robles area. Depends on what you are looking for. We were on the way home to So Cal from No Cal and this was a convenient stopping place. Level sites, new 50amp and full hookups. If you want a clean place on CA101 to overnight or use for a night or two to visit a few wineries it is a good place. 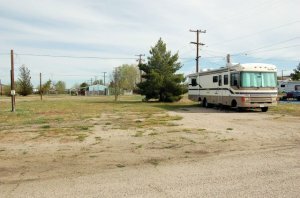 If you are looking for an RV resort or more than a basic place it is not for you. For us it is nicely situated for an overnight and has everything we need for a comfortable night stay. If it weren't for the health hazard and appearance of the many abandoned WW I and II buildings this would be a great place and value. The nice new sites all have Sewer, water 20, 30, 50 amps. Then there seems to be the old sites that are just OK, but for $10 a night it is worth staying here and going to see the Hearst Castle. The Jun 25, 12 is not what we found. The squirrels ar not as big as cats and they run from you; and our camp spot was gravel and level and no squirrels have come up on the gravel. w/20,30,50amp,s for $10 per night. We have signed up for 17 days and may stay longer. The staff is great and there is a great Elks lodge in Paso Robels. Wal-Mart is not a super but they have lots of food items. The Bud light was cheaper than the BX even with CFV and tax. This place is a health hazard! You drive through block after block of old buildings and barracks that are falling down and overgrown, not to mention the warning signs everywhere to keep out because of the danger from the condition, plus asbestos, lead based paint, hanta-virus and snakes! Hanta-virsu is air-born and caused by rodents. Our campsite was over run with squirrels the size of house cats. Next to the campground is a very old burned out double-wide with junk and debris scattered all over. The entire base is junk and debris ridden. There is no internet at the "Internet Cafe" and the dining room was closed during the dinner hour. We wanted to spend a couple of days in the area but couldn't stay there any longer than one night. What a shame and disgrace to the military. It is such a beautiful area to be treated as a junk pile! Just stopped here overnight. Took site 11 - in the old area but on the corner, so we could make it into a pull through for our 40' rig + toad. Road noise minimal, staff very friendly, quiet surroundings. Verizon aircard yielded consistent 4G 4 bars - way WAY better than we experienced at Vandenberg. Just about to sample the tri-tip recommended by another reviewer and then we will be on our way. We found it to be an excellent value for an overnight stay, but not much to do if we had had to be here longer. this is califs. original boot camp for the army way back during ww1, ww11, and part of viet nam. the entire place is literally falling down. shame on us for allowing so much history to fall down. the r.v. park is small, dusty, and way down at the south end of the base. we drove in, looked it over and went on down the road. pretty sad sack old place. for ten bucks it wold be an o.k. value, but the lack of virtually anything to do doesn't do it for us. The RV park is a bit remote as it is nearly 2 miles from the main (and only) gate. $10 per night is a great value. There are 10 recently added sites are are all pull throughs. Lots of places to eat in Paso Robles. Directions to billeting need to be updated. Once through the gate, you bear right at the Y and follow the road to the stop sign. The billeting office will be on your left. The staff at billeting are very friendly. The internet cafe charges $3.50/hr. Find a Starbucks and enjoy a latte (or whatever your choice) and free WiFi. Nice relaxing stop. There is a small exchange and just outside is an eatery where the fellow has great tri-tip and pulled pork sandwiches. If, like us, you want full hook-ups and solitude, this is the place. Park is very bare-bones but they have plans to upgrade it. People on this base are very very friendly and helpful. Great sandwiches and smoothies at the internet cafe. Retirees can eat at the dining facility. We didn't use it, but were told the food is very good. Small fitness center behind Billeting. The museum across the street from the fitness center is not to be missed. Open Thursdays and Saturdays. We visited twice during our two weeks at the base and will return next year. We really enjoy this place. 10 new gravel sites added within the last ?6 months. Easy access, great hook ups. Very friendly staff at billeting office. You can't beat the price. 48 mile drive over excellent roads to visit Hearst Castle. Hearst Castle has large RV parking area. Driving vehicles over 30ft in length North of San Simeon, (Hearst Castle), on HWY1 not recommended as posted. Camp Roberts has a small PX with a fair selection of items/food. 13 Mile drive south on 101 to Paso Robles and Hwy 46 has numerous wine tasting stops/vineyards. No Wi-fi but verizon service good in the area. A good place to stop over or spend time to see Hearst Castle or visit vineyards. No traffic noise heard. We read complaints about traffic noise, but honestly we had more noise in some private resorts. This time of the year it is beautiful here. Billeting was very friendly and helpful. Travel to Paso Robles is 13 miles on 101 where there are lots of shops and wine/olive tasting. Only a short distance to the coast on a beautiful road. We stayed in the new site area. GREAT!!! We will return.